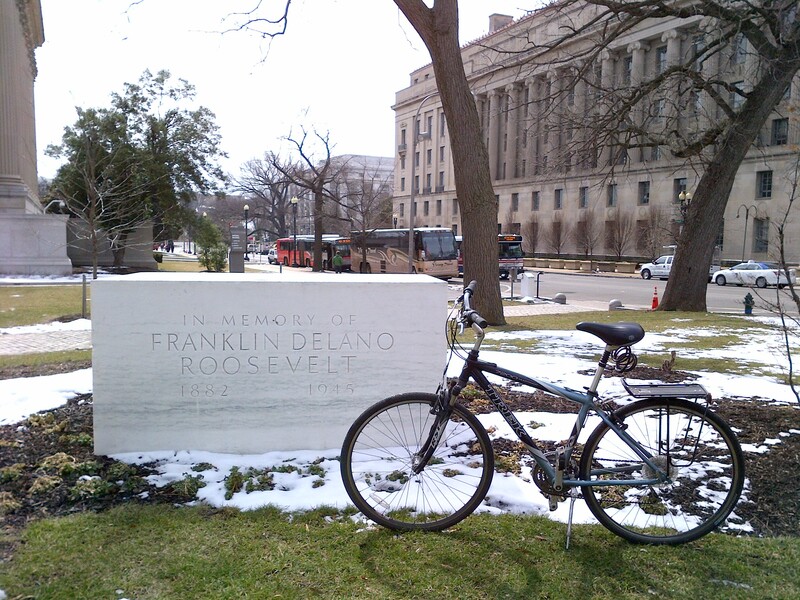 One of my goals for this blog has been to ride to and then write a post for each of the Presidential memorials in the greater D.C. metropolitan area. But in order to do this, it was first necessary to define what constitutes a Presidential memorial. Most Presidential memorials have a physical element which consists of a monument or a statue that is a permanent remembrance of the President it represents. This is evidenced by the city’s most well known ones, such as The Washington Monument, The Lincoln Memorial and The Jefferson Memorial. 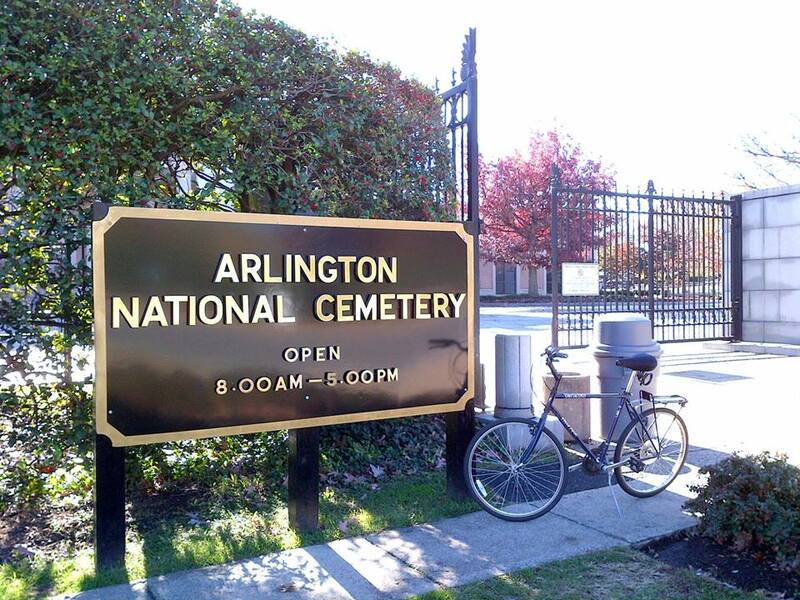 However, some Presidential memorials have no physical presence at all. This type of memorial is referred to as a living memorial. An example of this would be The Harry S. Truman Scholarship, which is awarded to U.S. college students dedicated to public service and policy leadership. 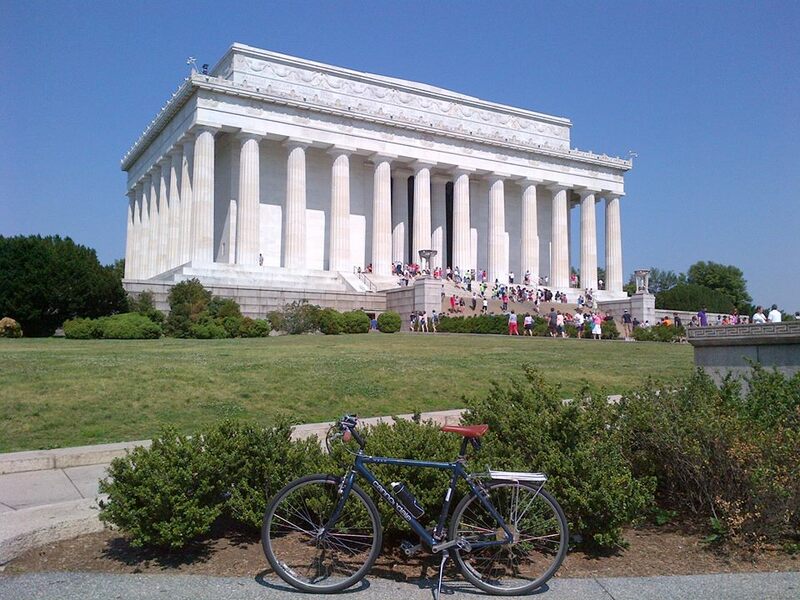 Although it has no physical presence, it is the sole national memorial permitted under Federal law to honor President Truman. 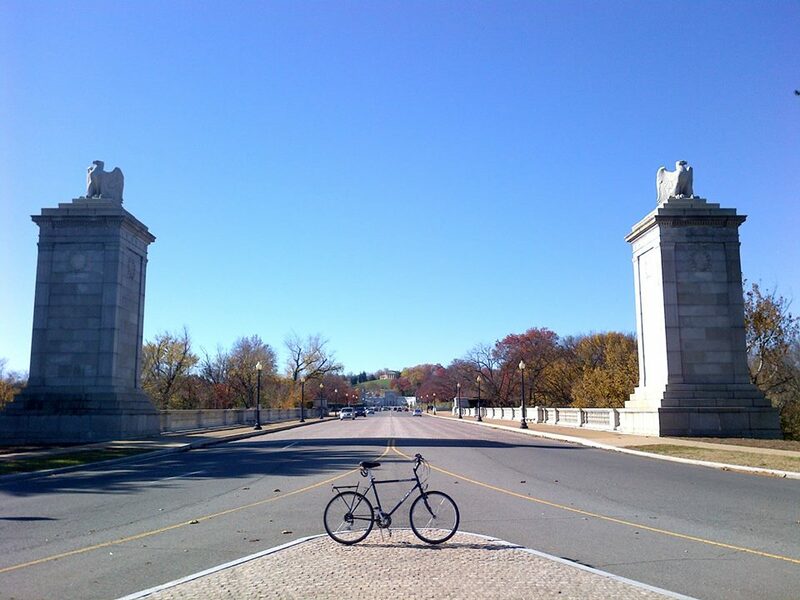 Once the definition was established, I was able to determine which memorials I would be able to ride to, and which ones had no physical presence, or were out of the local area and too far away to visit during one of my lunchtime bike rides. 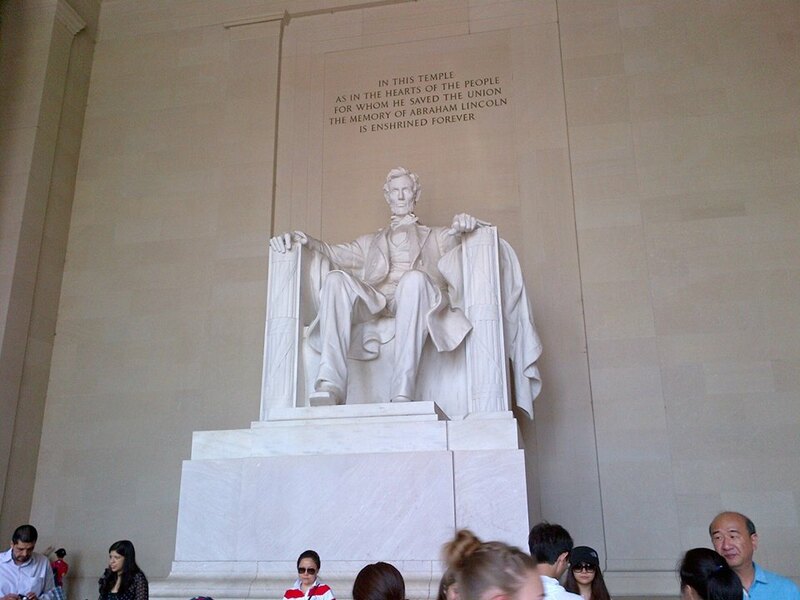 So far I have been able to identify 17 official Presidential memorials with a physical presence, as well as a number of other statues, buildings, streets, monuments and one airport which are named after a President but are considered unofficial because they were not authorized by Congress or were privately built. There are also two official Presidential memorials which have been approved and are currently in the planning stages. 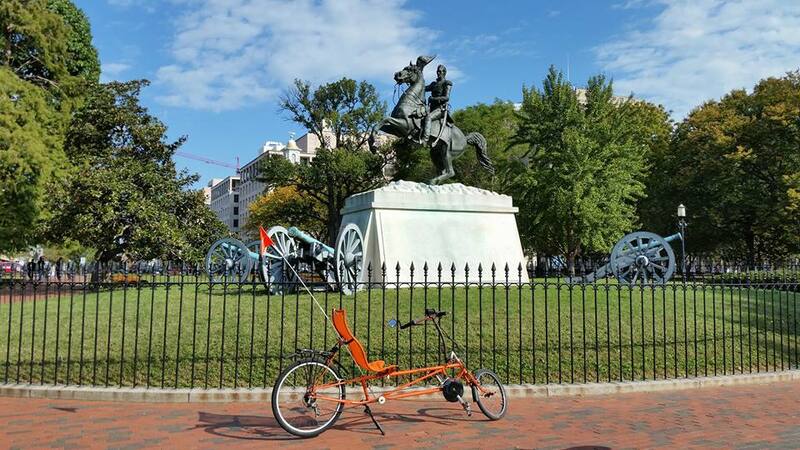 On this bike ride I chose to go to one of the memorials that I have not already visited – The General Andrew Jackson Statue. 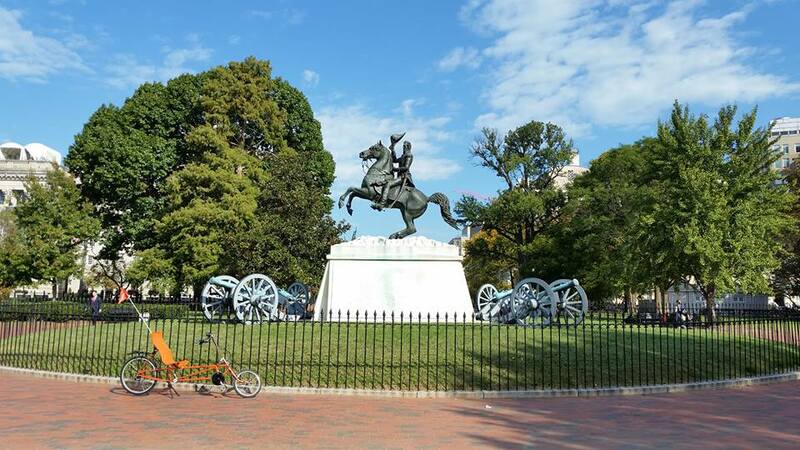 Located in the middle of Lafayette Square Park, the memorial to our nation’s seventh President is an iconic equestrian statue. Commissioned in May of 1847, just two years after his death, the Jackson memorial statue was designed and created by American sculptor Clark Mills. Mills also created the statue called Freedom that now sits a top the dome of the United States Capitol Building. The 15-ton statue of the man nicknamed “Old Hickory” was cast in bronze in 1852, making it the first bronze statue cast in America. It also gained additional fame because it was the first equestrian statue in the world to be balanced solely on the horse’s hind legs. 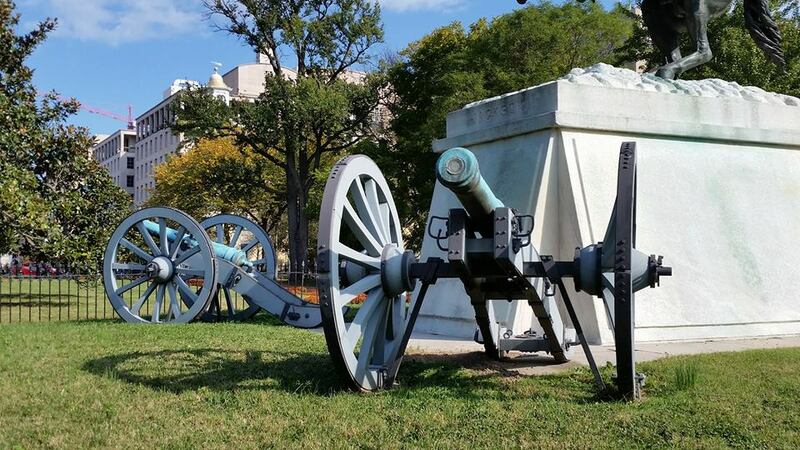 The memorial also includes four cannons, positioned at the corners of the marble base, that Jackson had captured in battle that were considered historic trophies. The pair of cannons on the north had been cast at the Royal Foundry of Barcelona in 1748 and were named for two Visigoth kings: El Witiza and El Egica. The two on the south were cast in 1773 and were named for two Greek gods: El Apolo and El Aristeo. 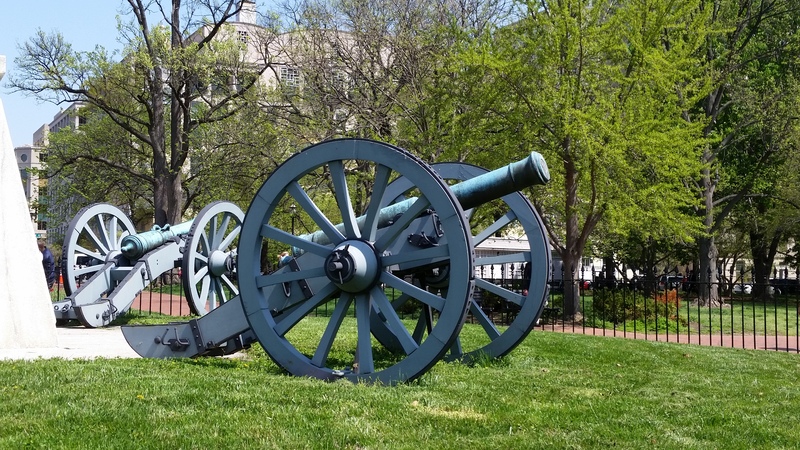 The statue and cannons were later enclosed by an iron fence. 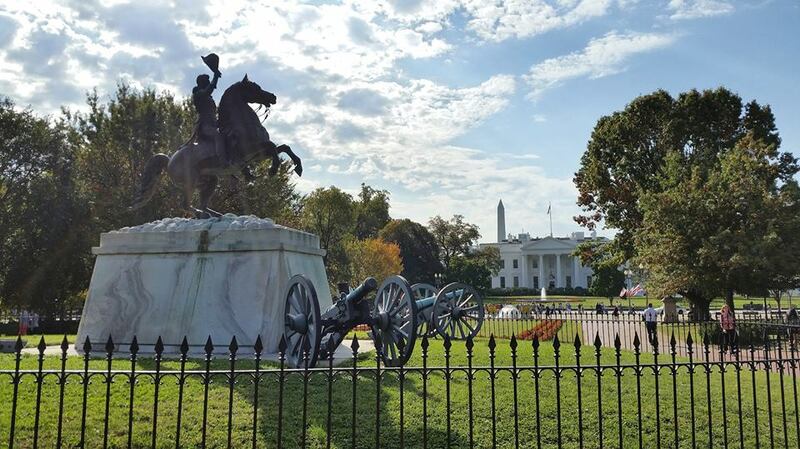 Amid much fanfare, the statue was dedicated on January 8, 1853, with an elaborate parade preceding the dedication. A distinguished group including General Winfield Scott, Senator Stephen A. Douglas of Illinois, and the mayor and city council of D.C. marched to the entrance of The White House, where they were greeted by President Millard Fillmore and his cabinet. Through a crowd of more than twenty thousand, they then proceeded across the street to Lafayette Park for the dedication. Senator Douglas gave an address on the military accomplishments of Jackson, and then introduced Mills. However, Mills was so overcome with emotion that he could not speak and only pointed to the statue, which was then unveiled. 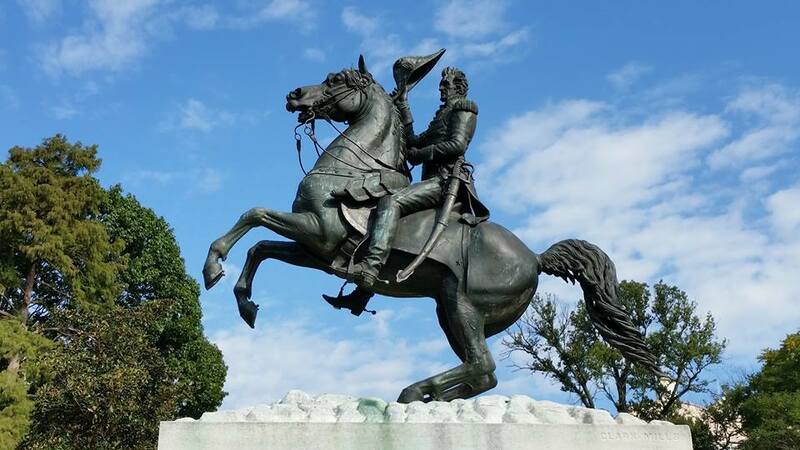 The Jackson memorial statue is one of the nation’s most recognizable sculptures, albeit one that might be easily overlooked given its setting among so many other statues and its proximity to the White House. And although you have more likely than not seen it before in photos and on film, I highly recommend seeing it in person. 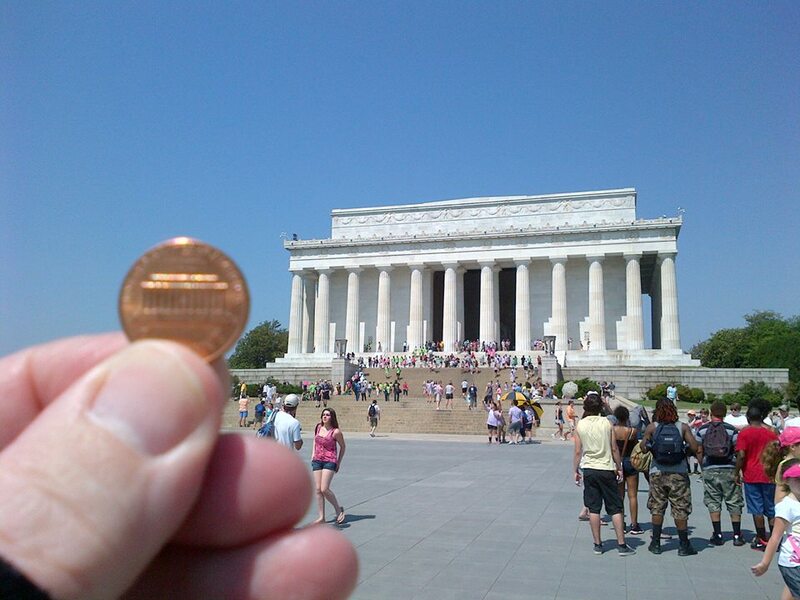 However, if you are unable to see the original statue here in D.C., there are other opportunities. Mills went on to make replicas for New Orleans in 1856 and for Nashville in 1880. A fourth copy was cast in 1987 for outdoor display in Jacksonville, Florida. For myself, I hope to be able to say one day that I have seen all four of them. On this lunchtime bike ride I visited the national memorial to a man who George Washington regarded as his mentor, and who was described by Thomas Jefferson as “the wisest man of his generation.” The memorial honors George Mason, and is located at 900 Ohio Drive (MAP), near the Tidal Basin and The Jefferson Memorial, in southwest D.C.’s West Potomac Park. 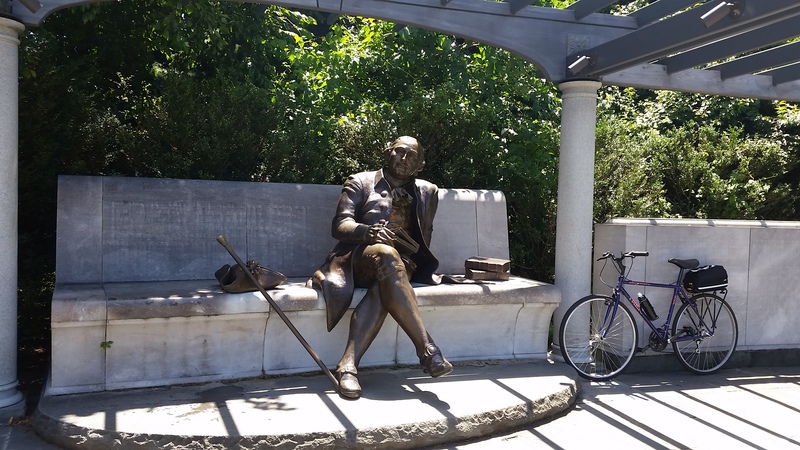 George Mason, one of our nation’s Founding Fathers, devoted himself to achieving American independence, despite being a widower with nine children to raise. He was the author of the Fairfax Resolves that recommended a “continental congress” to preserve colonial rights. And in 1776, as a member of the Virginia House of Burgesses, Mason wrote the Virginia Constitution and the landmark Virginia Declaration of Rights, the seminal document that not only influenced Thomas Jefferson when he wrote the Declaration of Independence, but also France’s 1789 Declaration of the Rights of Man and the United Nations’ 1954 Universal Declaration of Human Rights. 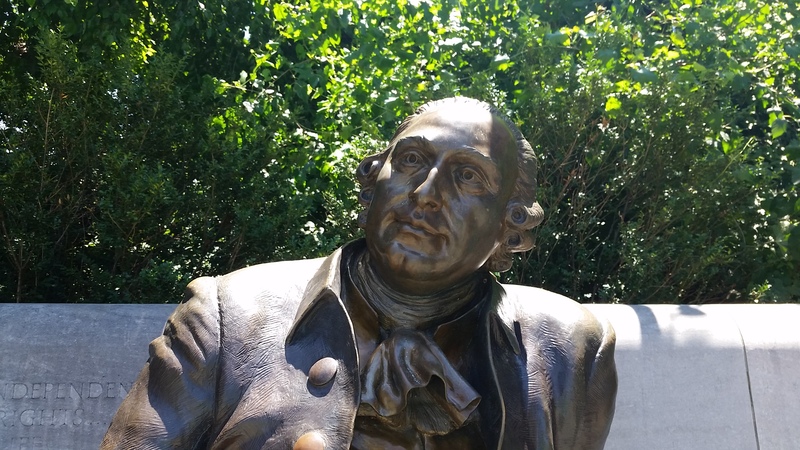 The George Mason Memorial features a 72-foot long stone wall with a larger than life-sized bronze statue of Mason staring off into the distance. He is depicted sitting with his legs crossed, holding a book, with his walking stick and hat on the bench to his right and a stack of books to his left. The statue is situated under a trellis, in a landscaped grove of trees and flower beds set among concentric circles around a circular pool with a fountain. The memorial was designed by sculptor Wendy M. Ross and landscape architect Faye B. Harwell. Because there were no reliable images of Mason for her to accurately render her statue of him, Ross’s depiction is based on descriptions from Mason’s family and friends, a meeting with Mason’s living relatives, and a single posthumous painting of Mason which is located at Gunston Hall, Mason’s Georgian-style mansion near the Potomac River just 24 miles south of the memorial in nearby Mason Neck, Virginia. Harwell designed the memorial’s landscaping features to adapt to the site’s history as a formal garden, as well as Mason’s love of gardens. 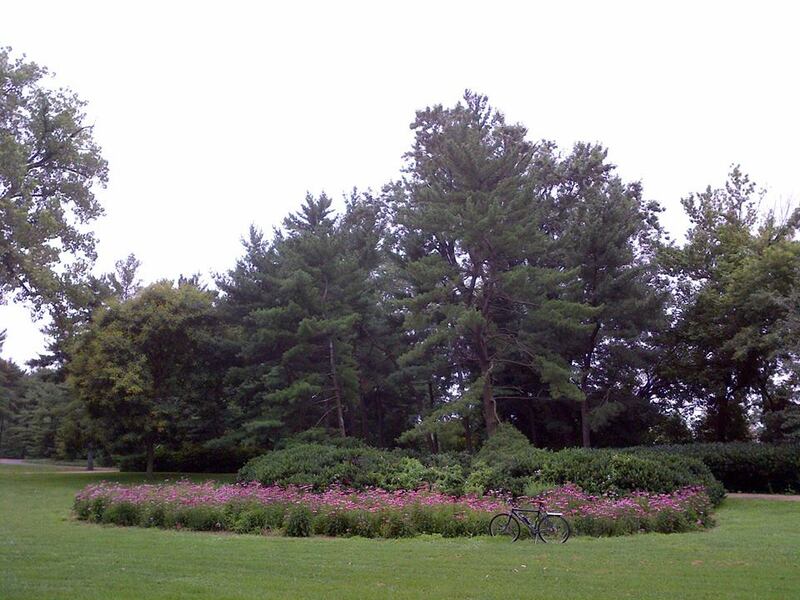 The site had originally been a Victorian garden in the late 19th century, which was subsequently designated in 1902 as one of the four national gardens established by The McMillan Plan, a comprehensive planning document for the development of the national capital city’s monumental core and the park system. In 1929, the site was redesigned as The Pansy Garden. This garden and its accompanying fountain which was used by Harwell in the design of the memorial. 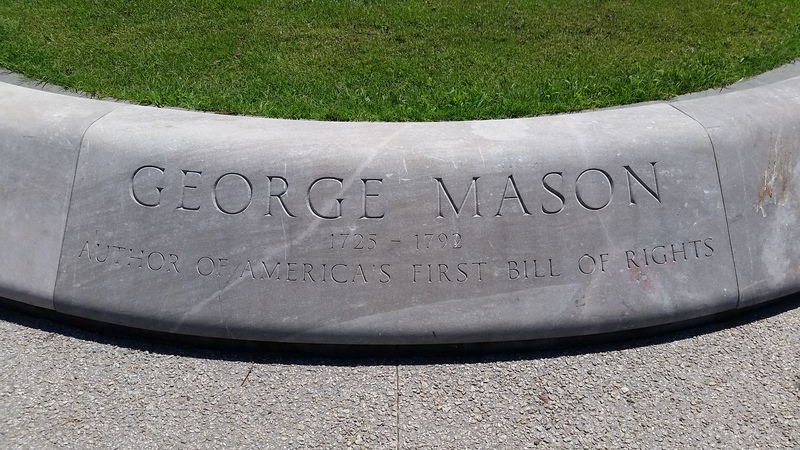 The George Mason Memorial was authorized by Congress in August of 1990, with groundbreaking just over a decade later in October of 2000. It was completed and dedicated in April of 2002, and is managed by the National Park Service. 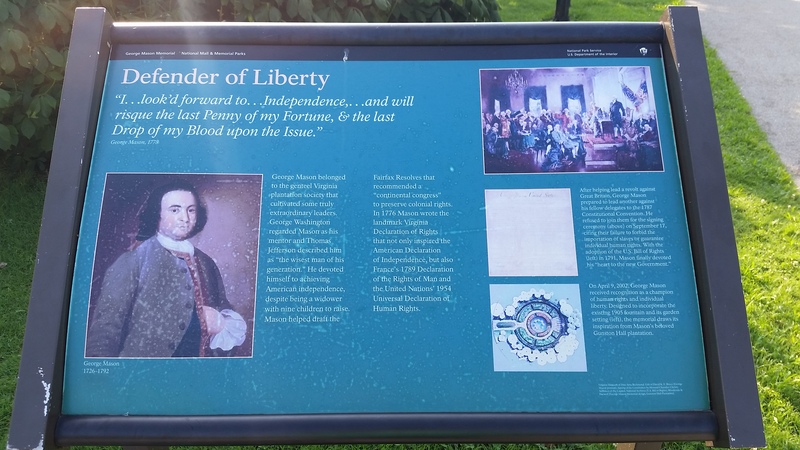 It is the first memorial in the Tidal Basin area dedicated to an individual who did not serve as president, and among the last to be sited on the grounds of the National Mall. When it comes to Presidential memorials in D.C., there have been occasions when people decide after the memorial is completed that it is not quite right, or not big enough, or somehow unbefitting the president who it is intended to honor. And instead of accepting or even modifying the original memorial, they build a second, grander presidential memorial, often in what is considered a more prominent location. And interestingly, it is usually the second memorial with which the public is most familiar. This happened when The Original Washington Monument was deemed insufficient, and the giant obelisk on the National Mall was erected to honor our nation’s first president. 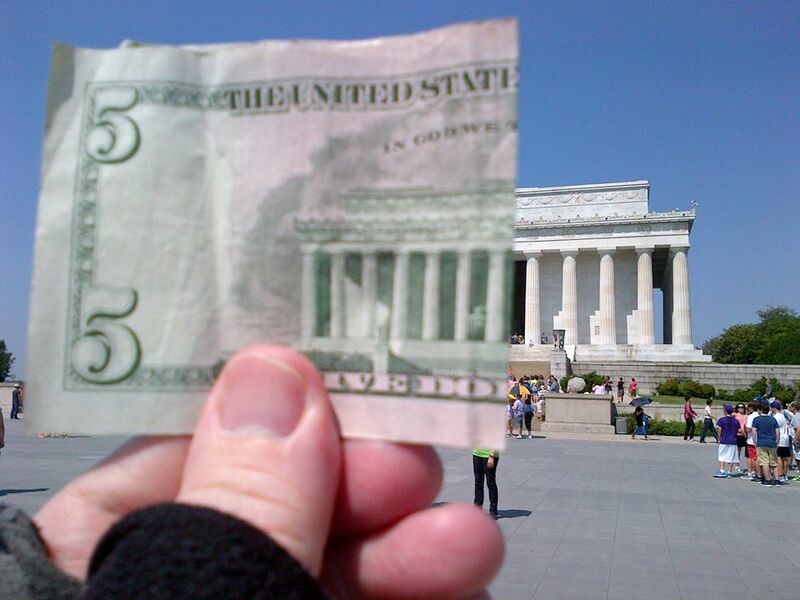 The same type of thing happened again more recently when the existing memorial to our nation’s 32nd president, Franklin Delano Roosevelt, was deemed inadequate, and another, larger memorial was constructed near the Tidal Basin (MAP), which is considered one of the most prominent locations in the national capitol city. 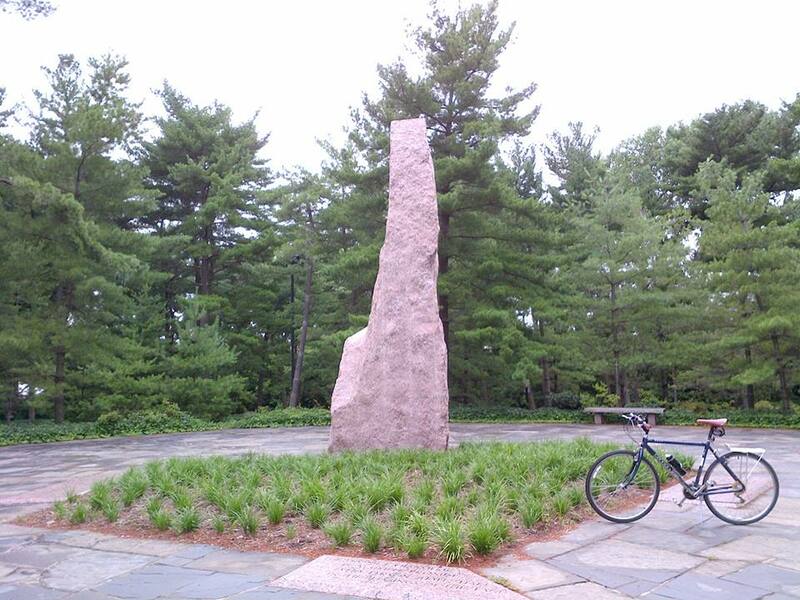 It was to this memorial that I went on today’s bike ride. 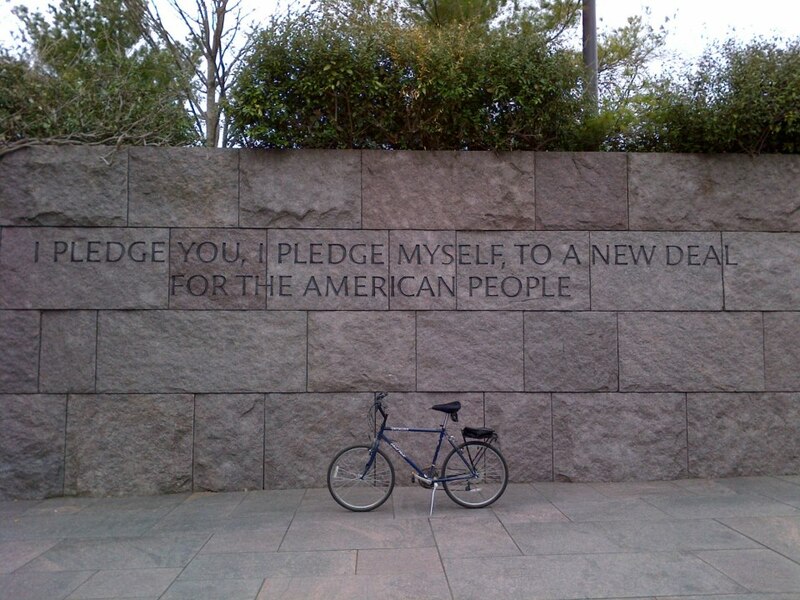 Thirty-two years later, in contradiction to Roosevelt’s specific wishes, the more well-known FDR Memorial was dedicated. The newer memorial is large, even by D.C. standards. 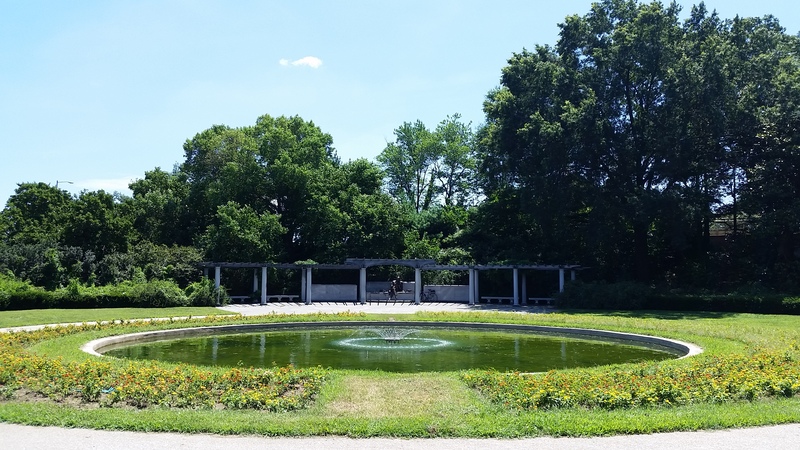 Spread out over seven and a half acres on the southern side of The Tidal Basin, it traces 12 years of the history of the U.S. through a sequence of four outdoor “rooms,” one for each of his terms in office, from 1933 until his death in 1945. 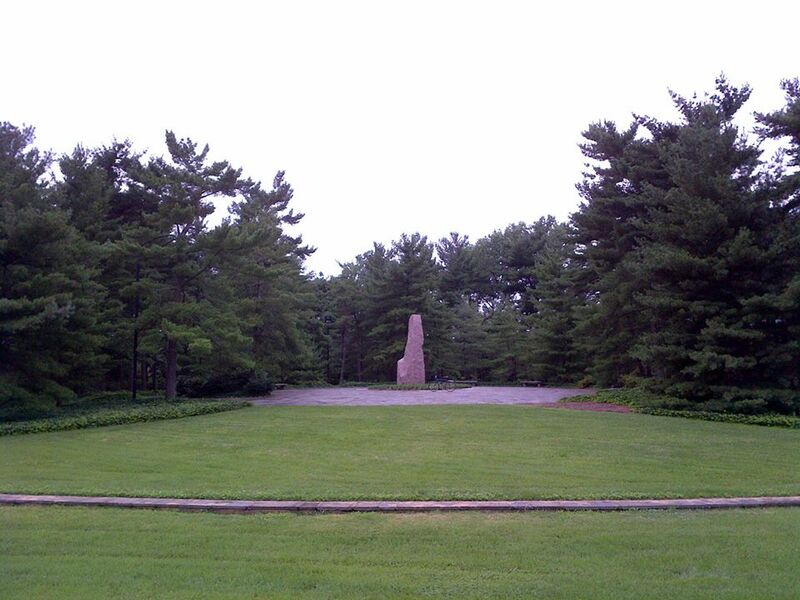 The design of the memorial, by landscape architect Lawrence Halprin, was chosen in 1978, and it opened to the public in 1997 after a dedication ceremony led by President Bill Clinton. As an historic area managed by the National Park Service, the memorial is listed on the National Register of Historic Places. 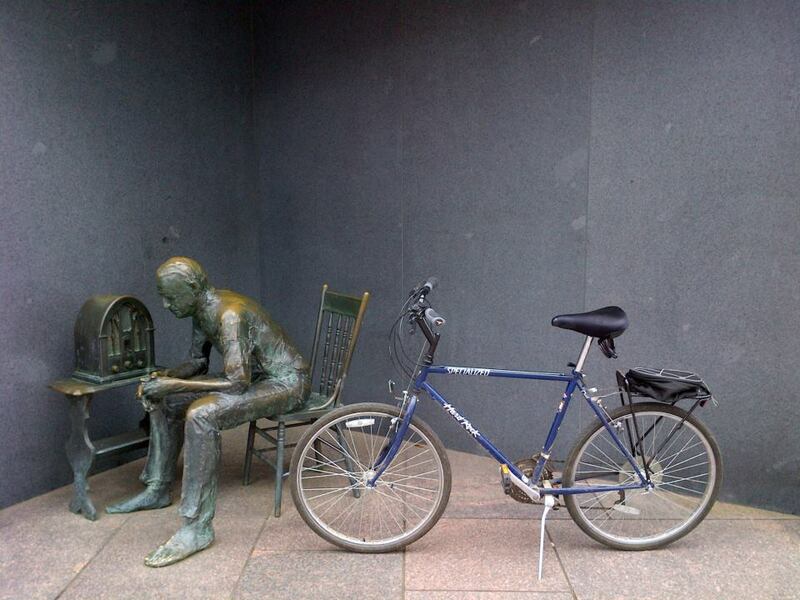 The memorial contains a number of sculptures inspired by famous photographs of Roosevelt. One depicts the 32nd president alongside his pet Scottie named Fala. It is the only presidential pet to be memorialized. Other sculptures depict scenes from the Great Depression, such as listening to a fireside chat on the radio and waiting in a bread line. 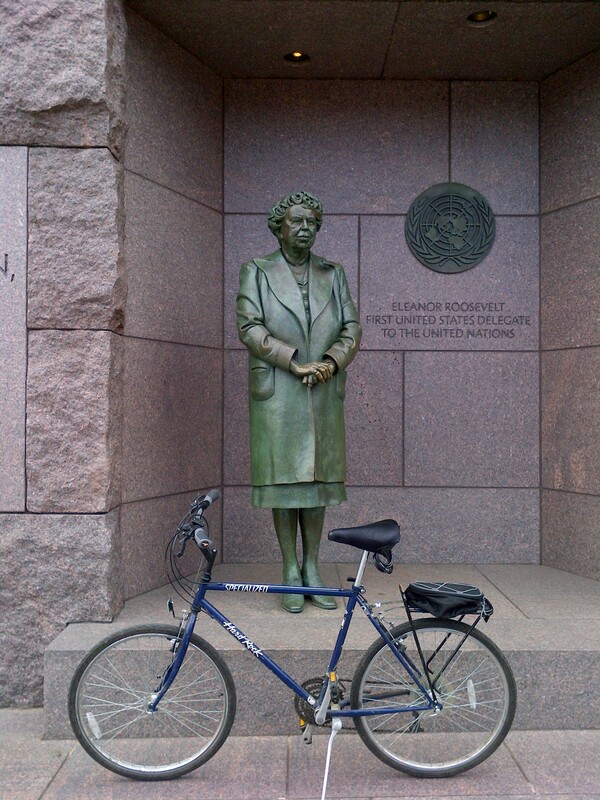 Also included is a bronze statue of First Lady Eleanor Roosevelt standing before the United Nations (UN) emblem, honoring her dedication to the UN. It is the only presidential memorial to depict a First Lady. Water is also used prominently in the memorial as a metaphorical device, including waterfalls depicting World War II and the Great Depression, and a still pool representing the 32nd president’s death. 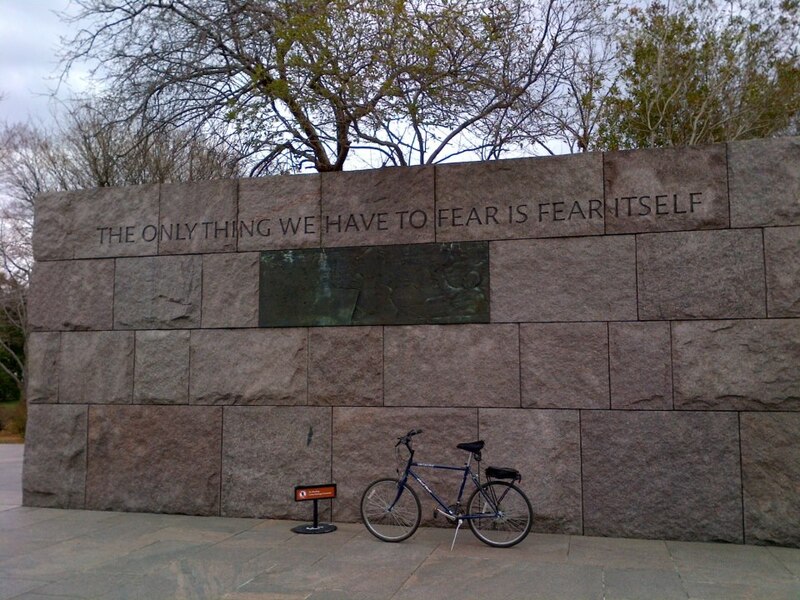 However, like many memorials and monuments in D.C., the FDR Memorial is not without controversy. 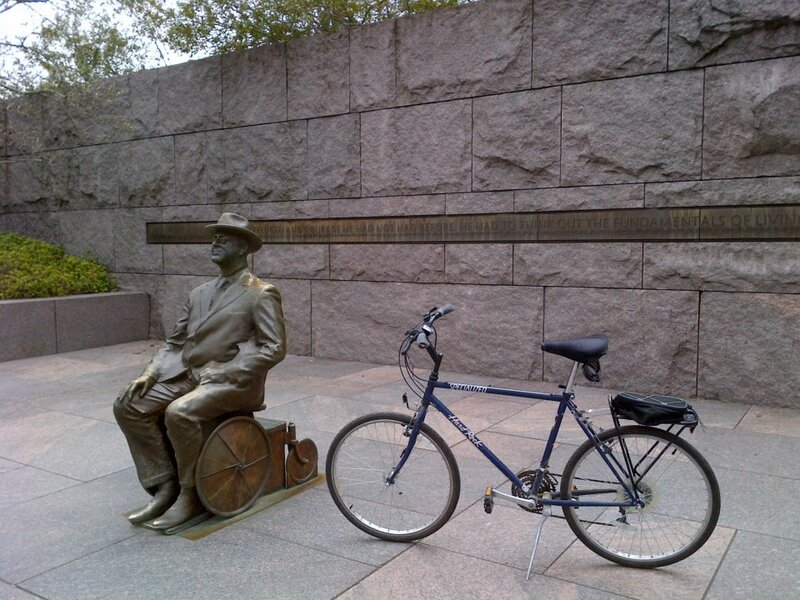 Taking into consideration Roosevelt’s disability, the memorial’s design is intended to make it accessible to those with various physical impairments. For example, the memorial includes an area with tactile reliefs with braille writing for people who are visually impaired. 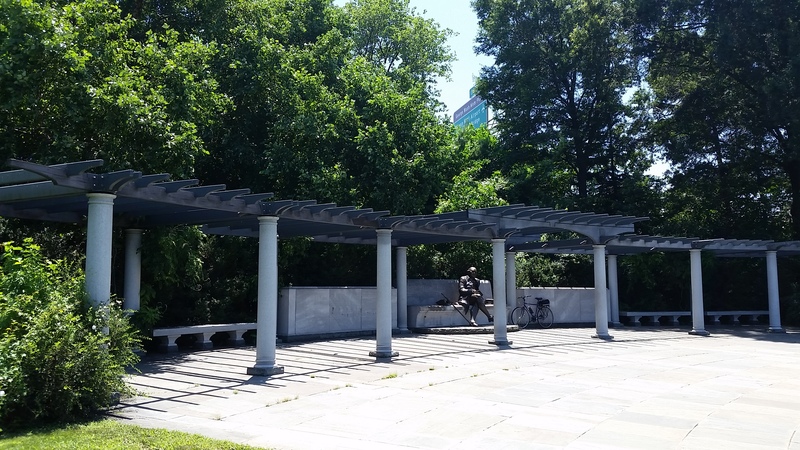 However, the memorial faced serious criticism from disabled activists because the braille dots were improperly spaced and some of the braille and reliefs were mounted eight feet off of the ground, placing it physically above the reach of most people. Another controversy involves one of the statues of Roosevelt. 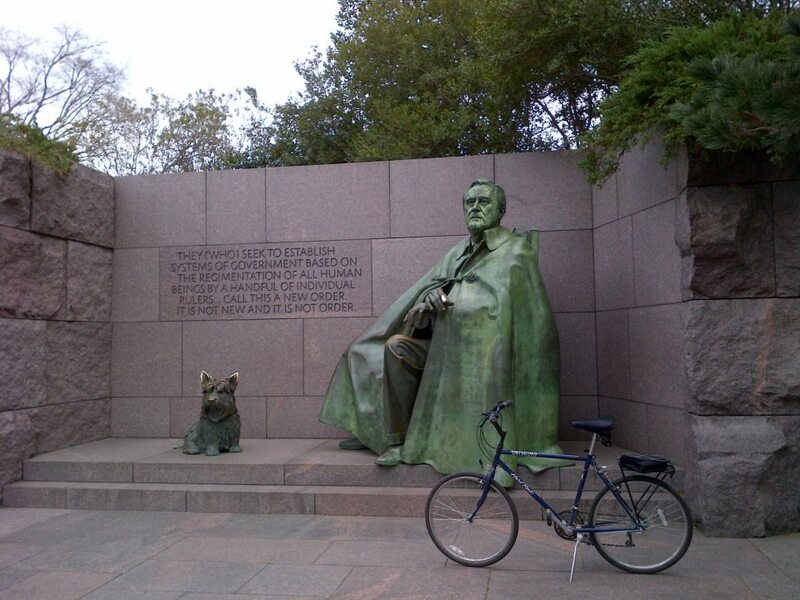 Against the wishes of some disability-rights advocates and historians, the memorial’s designers initially decided against plans to have Roosevelt shown in a wheelchair. Although Roosevelt used a wheelchair in private, it was hidden from the public because of the stigma of weakness which was associated with any disability at that time. So instead, the main statue in the memorial depicts the president in a chair, with a cloak obscuring the chair, which is how he usually appeared to the public during his lifetime. In a compromise, casters were added to the back of the chair, making it a symbolic “wheelchair”. However, the casters are only visible from behind the statue, and this compromise did not satisfy either side. 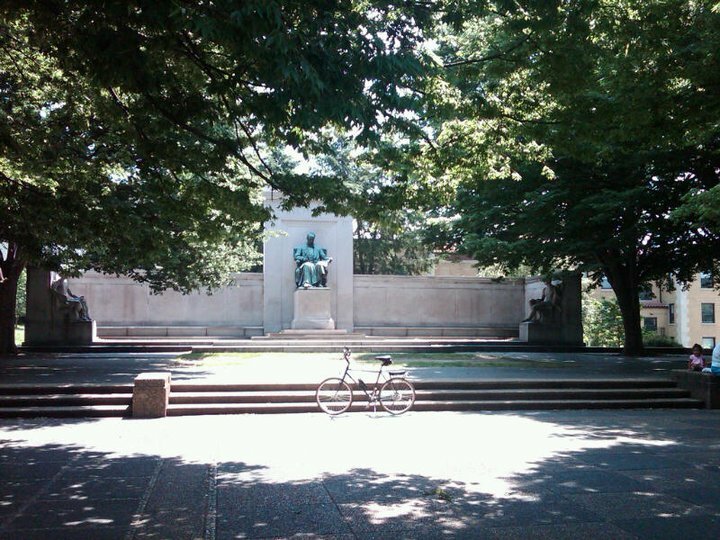 Eventually, an additional statue was added and placed near the memorial’s entrance which clearly depicts Roosevelt in a wheelchair much like the one he actually used. 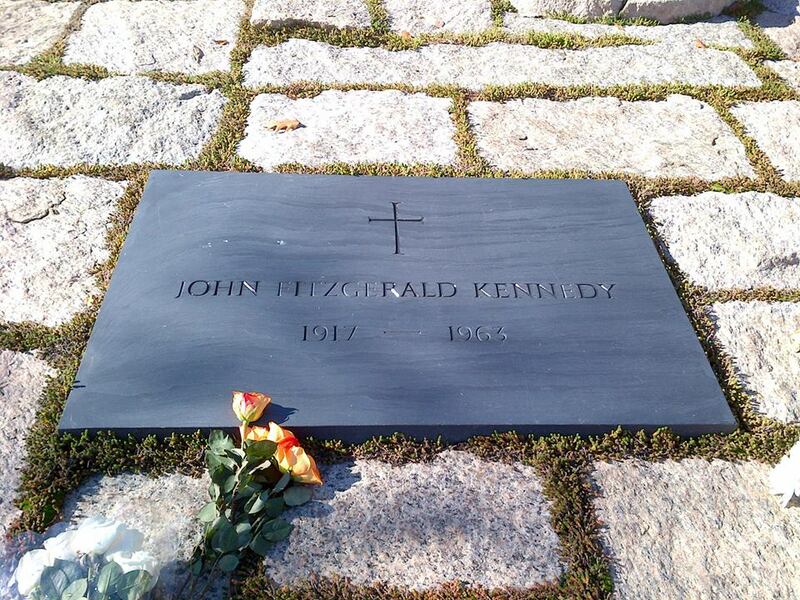 There are a number of gravesites of famous people in the D.C. area, but perhaps none more iconic than that of President John F. Kennedy. President Kennedy, the 35th president of the United States, was assassinated at the age of 46 during a trip to Dallas, Texas, in 1963. He was buried at Arlington National Cemetery, which is located in Virginia (MAP), directly across the Potomac River from the Lincoln Memorial. It has now been over 50 years since President Kennedy was killed, and on a recent bike ride I visited his gravesite and memorial. 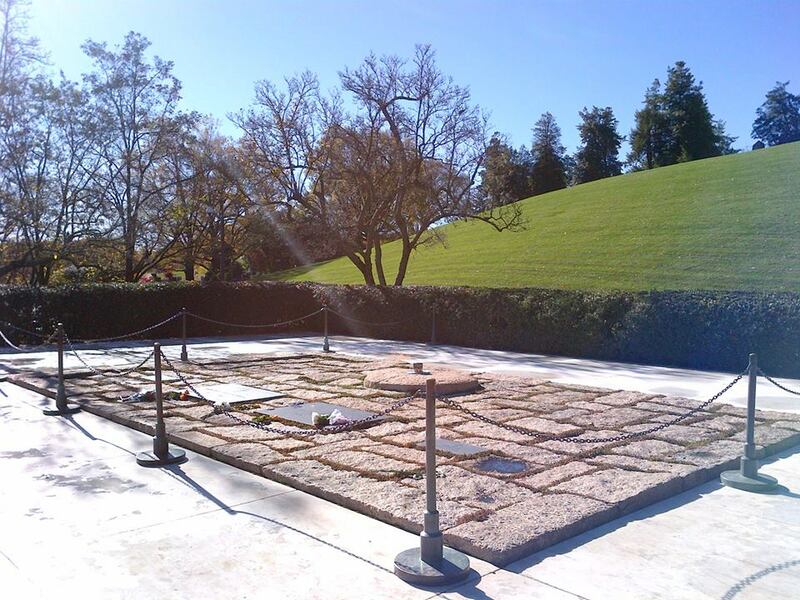 The John F. Kennedy Eternal Flame is a Presidential memorial at the gravesite of President Kennedy. The eternal flame was lighted by Mrs. Kennedy during her husband’s funeral, and burns from the center of a five-foot circular flat-granite stone at the head of the grave. The fuel is natural gas and is mixed with a controlled quantity of air to achieve the color and shape of the flame. The burner is a specially designed apparatus, containing a constantly flashing electric spark near the tip of the nozzle that relights the gas should the flame be extinguished by rain, wind or accident. 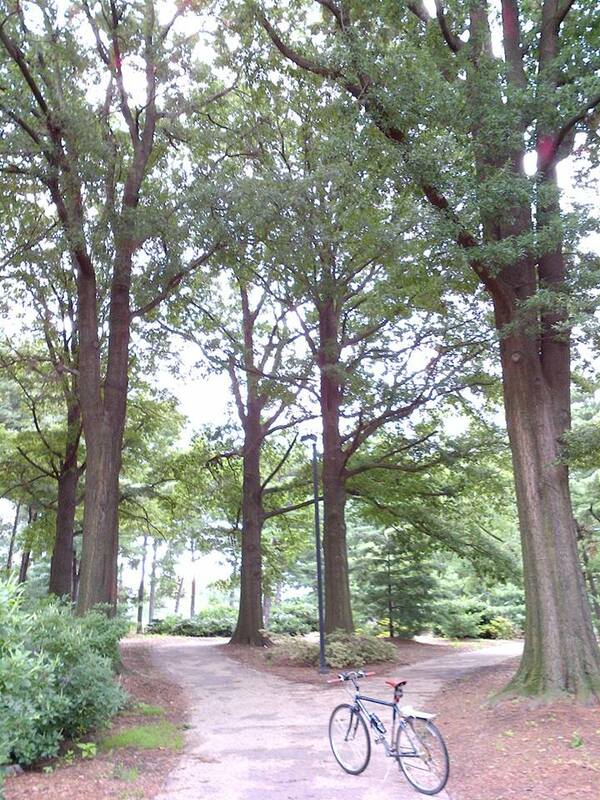 However, the eternal flame has been extinguished a couple of times by accident. On December 10, 1963, a group of Catholic schoolchildren were sprinkling the flame with holy water when the cap came off the bottle and water poured onto the flame, putting it out. A cemetery official quickly relit the flame by hand. Also, in August of 1967, an exceptionally heavy rain extinguished the flame. A nearby electrical transformer flooded as well, depriving the spark igniter of power and preventing the flame from being relit. After the rain ended, a cemetery official relit the flame by hand. On May 23, 1994, Jacqueline Bouvier Kennedy Onassis was buried next to President Kennedy. The gravesite was completed with the addition of her grave marker on October 6, 1994. 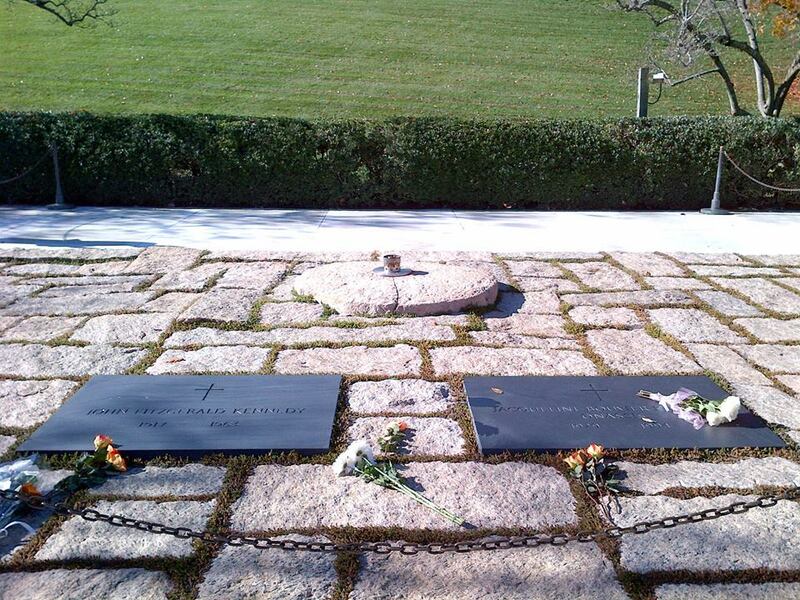 Two deceased Kennedy children were also reburied with their parents at the gravesite in Arlington, Patrick Bouvier Kennedy from Brookline – who had predeceased President Kennedy by 15 weeks – and an unnamed stillborn daughter from Newport, Rhode Island. 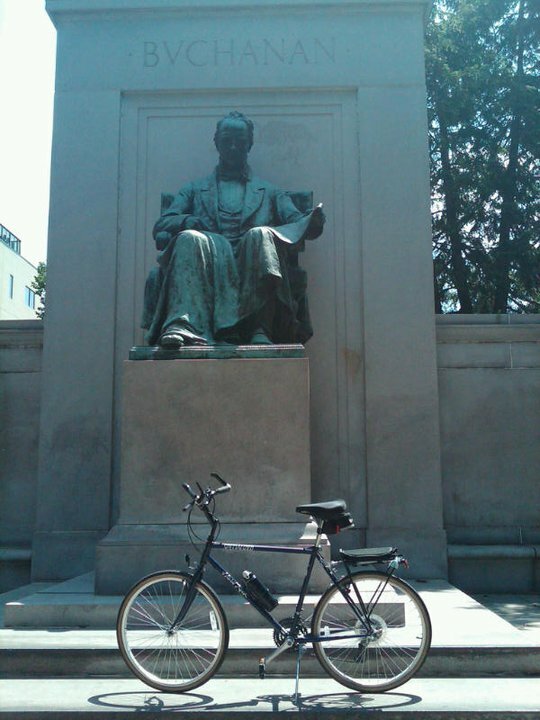 Located just a short bike ride away from the downtown cluster of monuments and memorials, the Presidential memorial to James Buchanan is located in the Southeast corner of Meridian Hill Park in Northwest D.C. (MAP). Buchanan is the last President born in the 18th century, and held the office immediately prior to the American Civil War, from 1857 until 1861. Buchanan’s unsuccessful efforts to maintain peace between the North and the South not only alienated both sides but led to the Southern states declaring their secession from the Union. Buchanan’s opinion was that secession was illegal, but that going to war to stop it was also illegal. By the time he left office, popular opinion was against him, and the Democratic Party had split. Buchanan had once aspired to a Presidency that would rank in history with that of George Washington. However, his inability to impose peace on sharply divided partisans on the brink of the Civil War has led to his consistent ranking by historians as one of the worst presidents in American history, and often assess his failure to deal with secession the worst presidential mistake ever made. The manner and process by which his memorial came to be reflects this widely-held opinion about him and his Presidency. Buchanan is the only President to have never married. As a result, he relied on his niece, Harriet Lane, to serve as White House hostess during his presidency. After Buchanan left office, the now-married and fairly wealthy Harriet Lane Johnston became a philanthropist, supporting children’s charities and donating a great deal of art to government museums. Someone eventually noticed that the bequest had an expiration date, and so Congress, always willing to spend money the is not there own, finally approved accepting the bequest and appropriated the funds for the memorial in 1918. 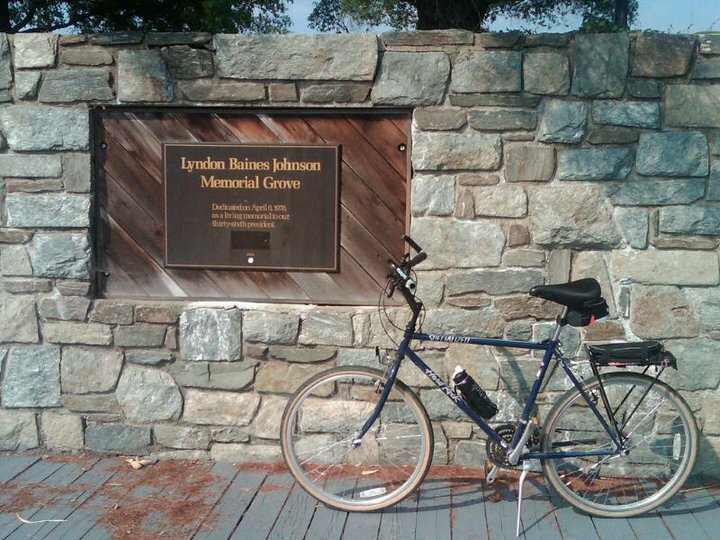 One of the more unusual Presidential memorials in the D.C. area is the one dedicated to Lyndon Baines Johnson. There is no street address for the memorial, which is located on D.C.’s Columbia Island, across the Boundary Channel from the Pentagon (MAP). 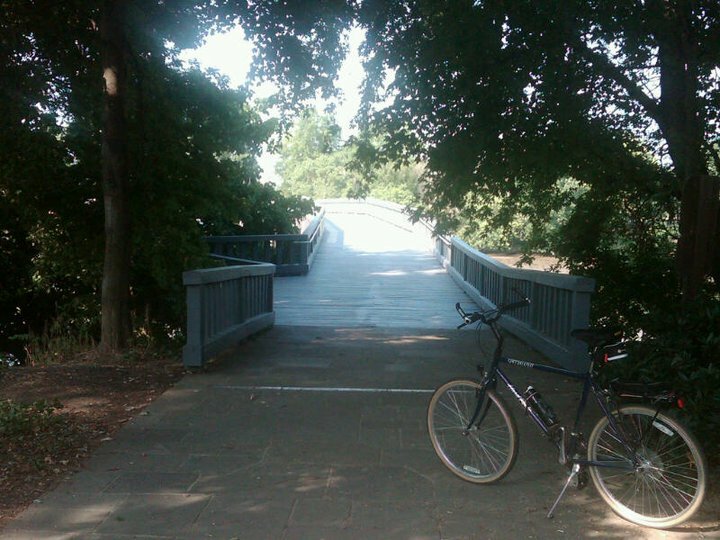 The park has three entrances, one on the George Washington Memorial Parkway, another on Boundary Channel Drive, and the third is a footbridge from the Pentagon parking lot. Shortly after his death in January of 1973, some of President Johnson’s friends and colleagues began to consider creating a national memorial to the 36th President. They decided that a grove of trees, a “living memorial,” would be symbolically appropriate for a man who valued nature in his personal life, and supported conservation and preservation of our America’s natural heritage during his presidency. By the end of the year, the memorial was authorized by Congress. It was also administratively listed on the National Register of Historic Places at that time. The memorial was dedicated in September of 1974, and is overseen by the National Park Service under the George Washington Memorial Parkway. 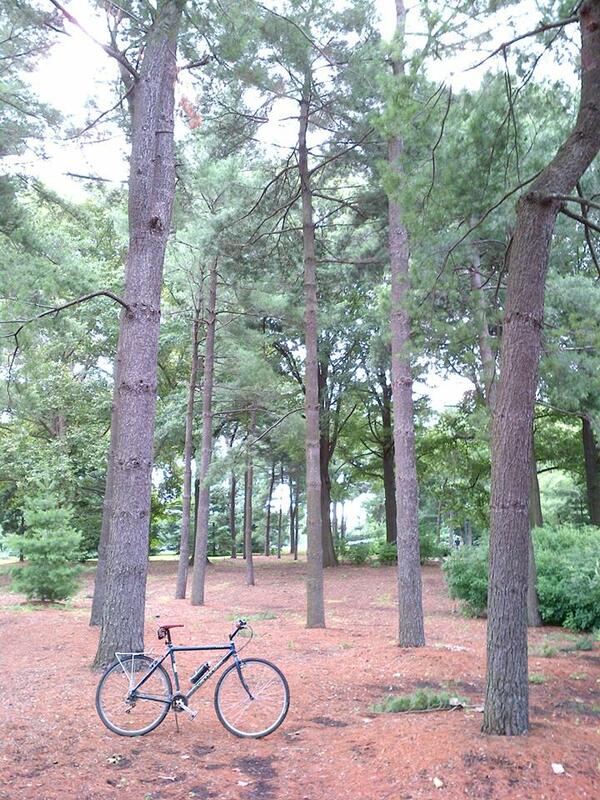 Officially known as The Lyndon Baines Johnson Memorial Grove on the Potomac, the memorial consists of two parts. The first area is commemorative in nature, and features a 19-foot tall, Texas red granite monolith in the center of a flagstone plaza. 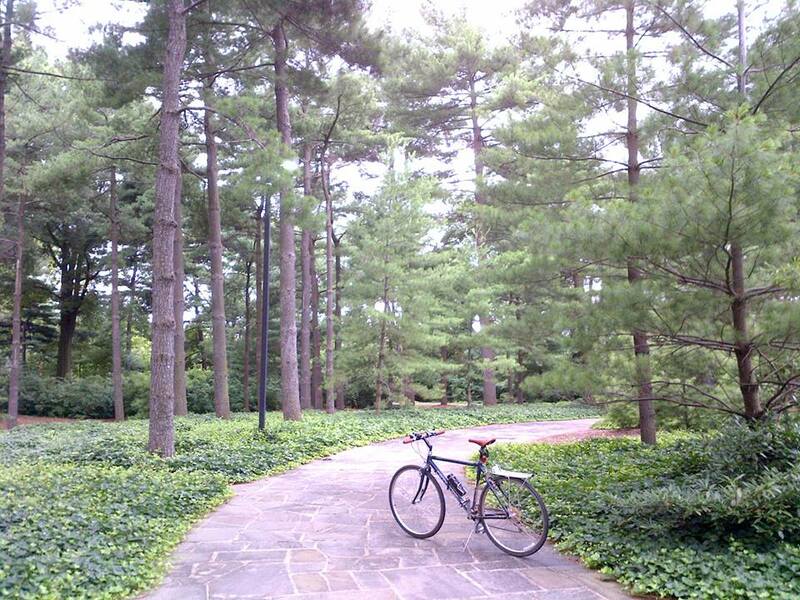 The grove, consisting of approximately 900 mature white pine trees encloses the plaza on three sides, and creates a dramatic feeling of enclosure for visitors walking serpentine pattern of walks and trails surrounding and leading to the plaza. 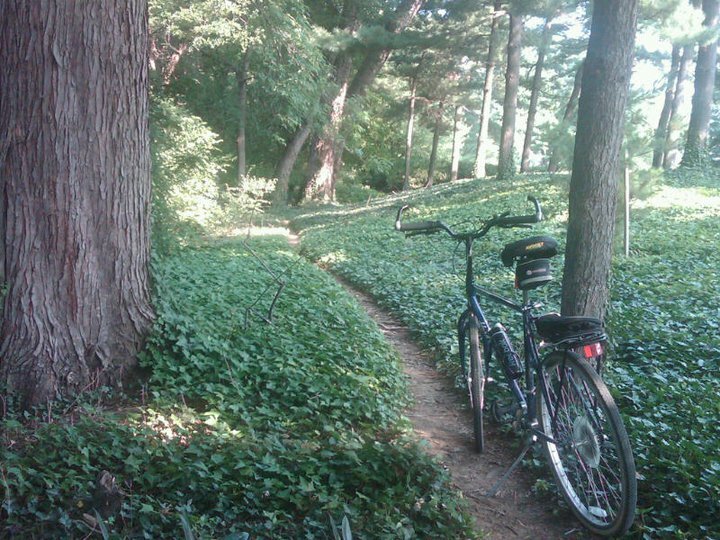 A variety of azaleas, rhododendron, flowering shrubs, wildflowers, and spring bulbs cover the ground beneath the trees. The remaining side of the plaza is an open and leads to the second area of the Memorial. 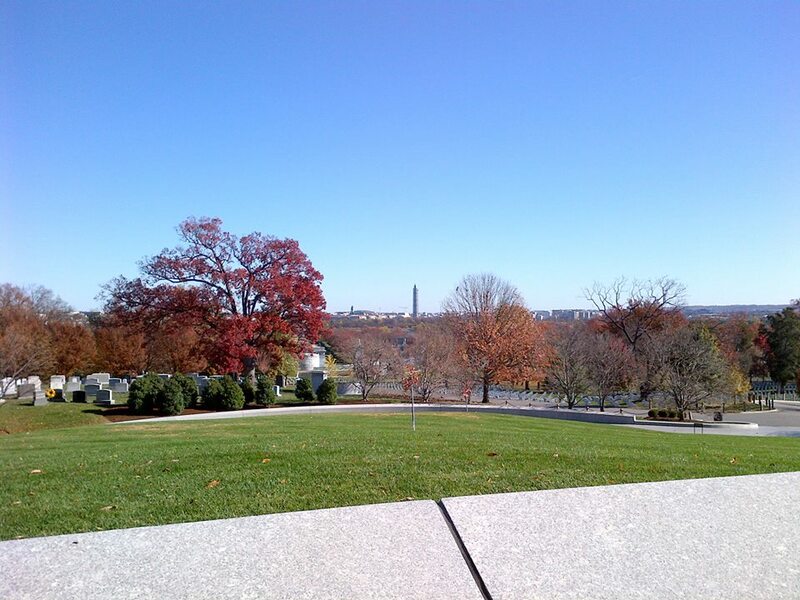 The Memorial’s second area focuses on the grassy meadow and overlooks the Potomac River vista of the Capital city. More informal than the plaza area, it provides a tranquil refuge for reflection and a variety of passive recreational activities. Benches along the gravel walkway that winds around the meadow give visitors a chance to sit and relax, and there are picnic tables under the trees that frame the meadow. 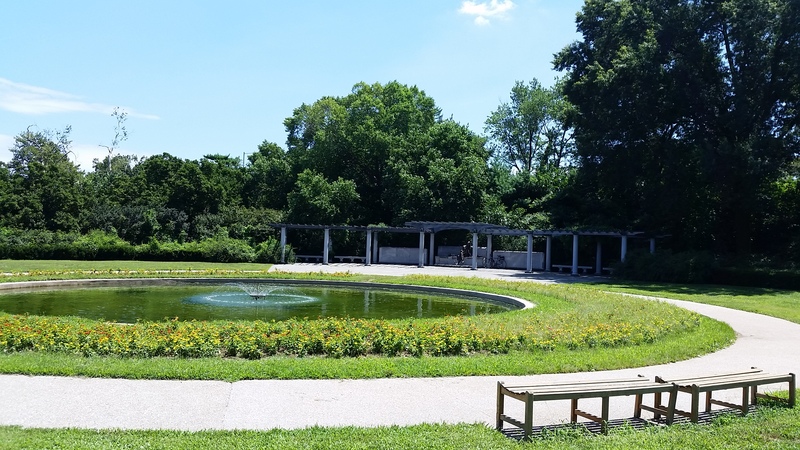 It is this tranquil area where President Johnson often went when he needed to immerse himself in deep thought, or just escape from the stresses of his Presidential responsibilities. 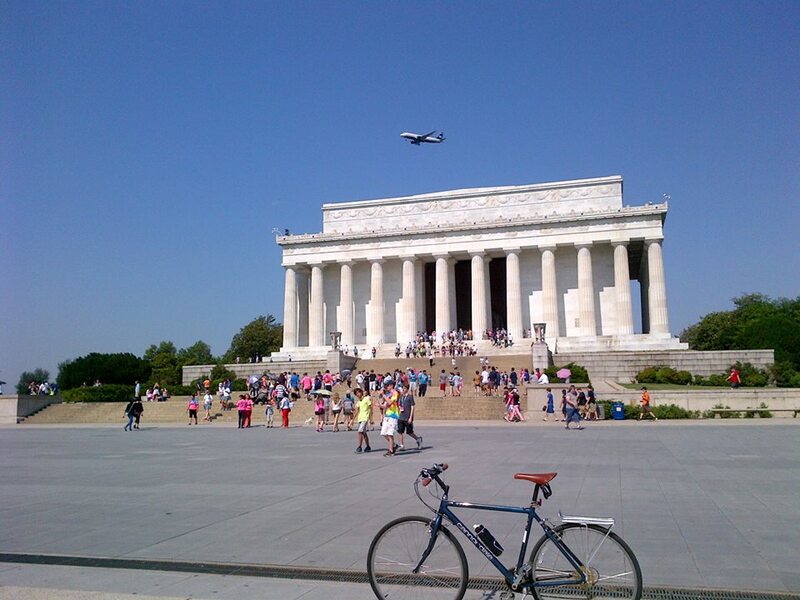 The dramatic departure of the national memorial to President Johnson, in comparison to the imposing architectural monuments to previous Presidents such as the Lincoln and Jefferson Memorials, makes it less alluring to tourists. Additionally, the somewhat isolated location of the memorial has contributed to making it one of the lesser visited ones in D.C. 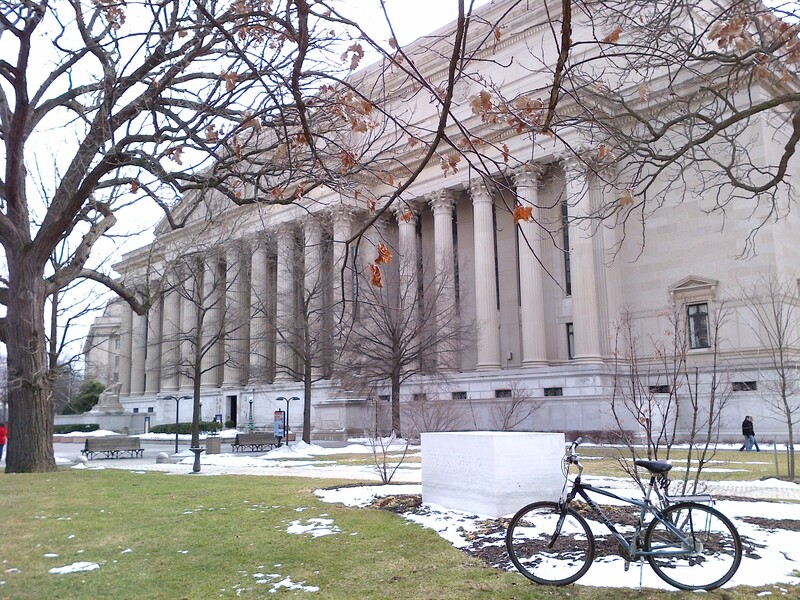 But it is for these reasons that I find the Johnson Memorial even more appealing. 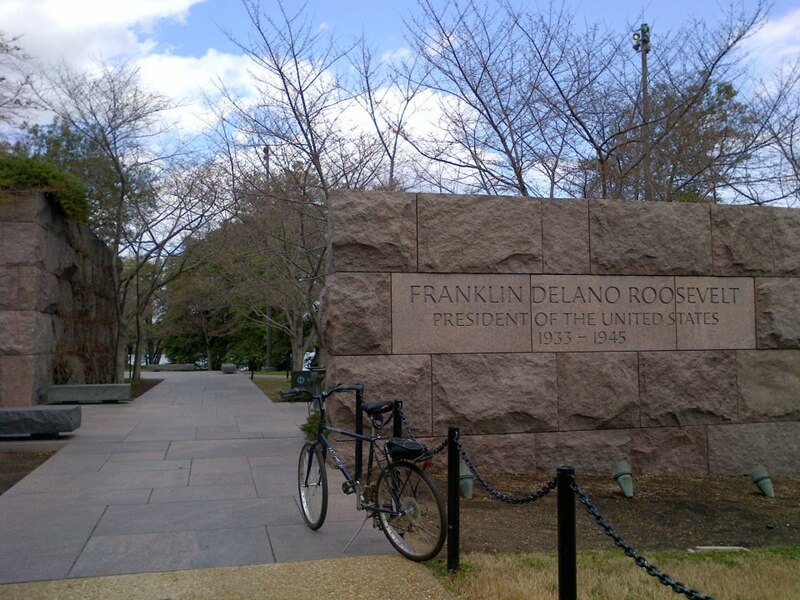 The Franklin Delano Roosevelt Memorial that is spread out over seven and a half acres on the southern side of The Tidal Basin may be the largest Presidential memorial in D.C. to honor our nation’s 32nd President, but it is not the only one. It was also not the first. 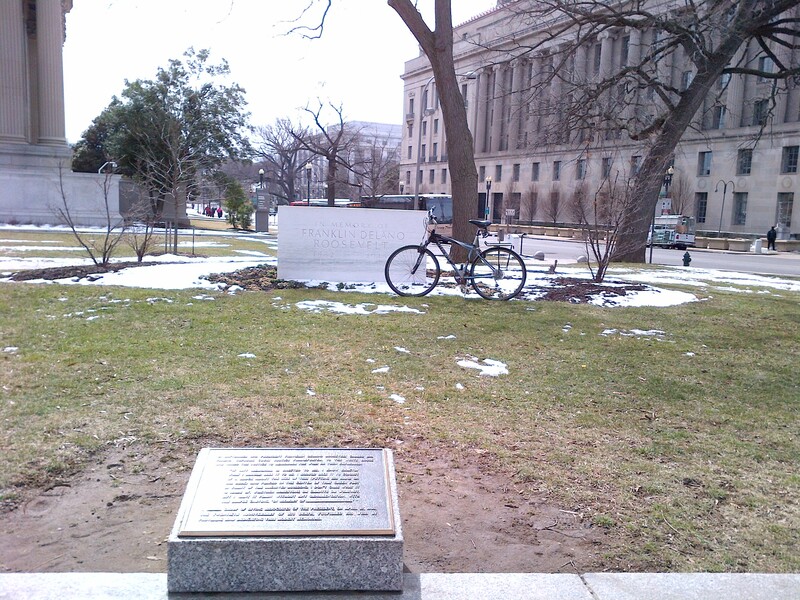 The original FDR Memorial, which relatively few people know about, is located in front of the National Archives building near the corner of 9th Street and Pennsylvania Avenue (MAP) in downtown D.C. However, his personal wishes notwithstanding, there was a lengthy argument following his death about the kind of memorial that the Federal government should create for FDR. 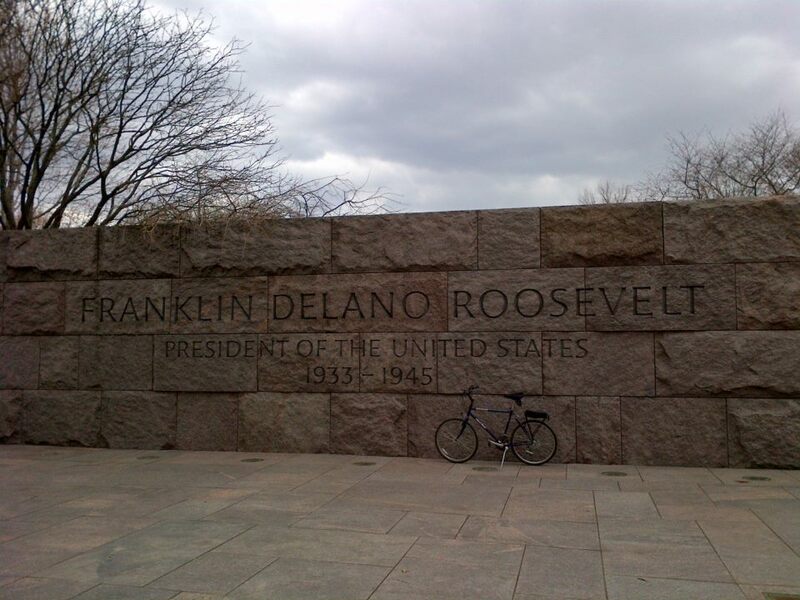 Congress authorized the establishment of the Franklin Delano Roosevelt Memorial Commission on August 11, 1955, and on September 1, 1959, it enacted legislation authorizing the Commission to announce a design competition. 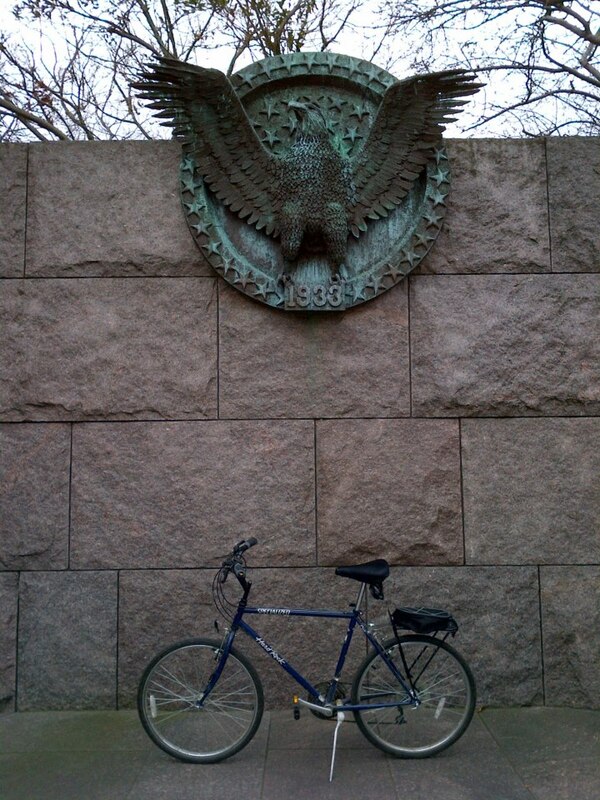 But getting any sort of memorial to FDR erected in D.C. was not a simple task. Millions of Americans intensely disliked FDR, and many still do, mostly because of the liberal New Deal programs he initiated. There was dissonance about the design selected, and even FDR’s family expressed concerns about the divisiveness and criticism that might accompany the establishment of a memorial at that time. 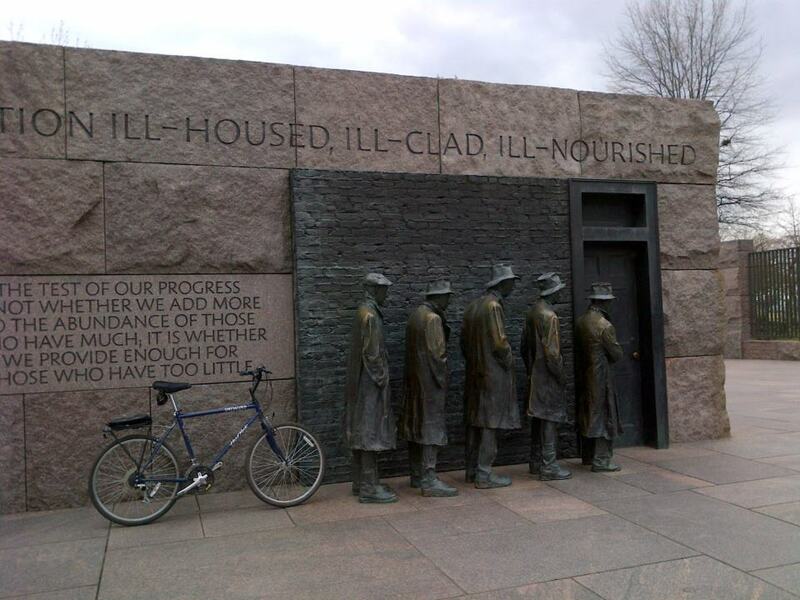 In the end, Congress held the FDR memorial issue in abeyance, at least for a few decades. 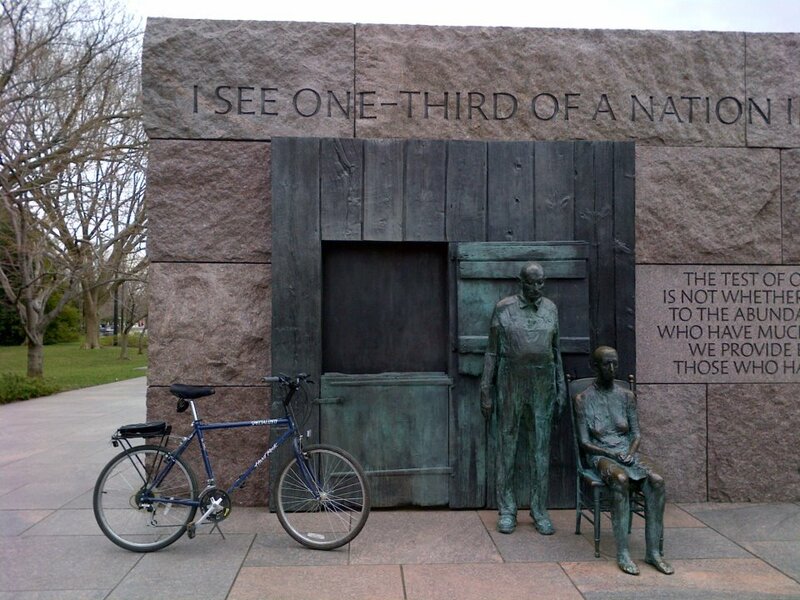 It was not until thirty years later, in contradiction to Roosevelt’s wishes, that the larger and more well-known FDR Memorial was dedicated. 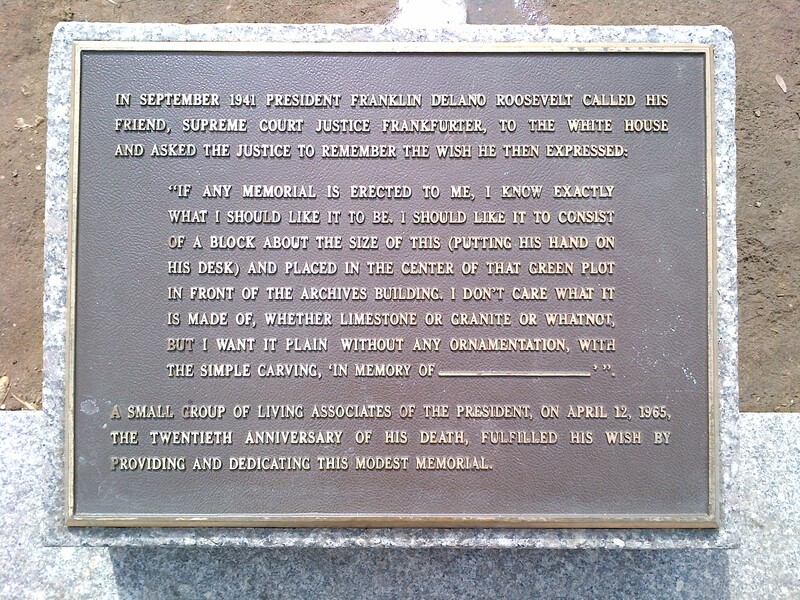 Of the two memorials, however, it is pretty clear that if Roosevelt could choose, he would opt for the original one.